So for those of you paying attention, I’ve been trying to branch out from my increasingly complex and introspective rants about audit, particularly encouraged by an analysis of my blog stats. It seems that visual aids have not just helped my clarity of expression, but also my readership. I’ve worked out how to add some sticky posts to my blog home page, and my 2 most popular, by a staggering factor, are the video animation, inspired by the youtube hits I found (which incidentally dealt my ego a severe blow, and which I cleverly but obscurely named from a line in the I Robot movie, which no-one got), and by my favourite blog of all time, the unpronounceable and consistently excellent xkcd. 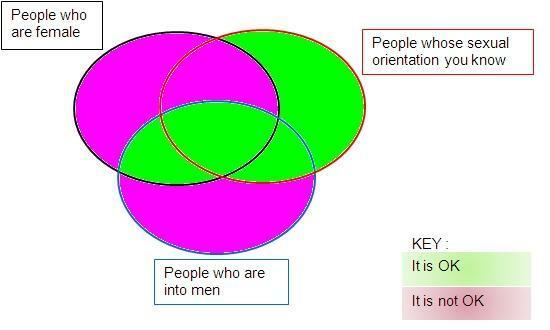 So anyway, it turns out Venn diagrams are not something that got easier since school. I came up with an idea a few weeks ago, thinking it would take all of 10 mins to sketch it out, 10 mins to copy my drawing onto a screen, presumably smoothing out the edges and tidying the whole thing up through the magic of computers (the way it turns my incoherent scrawl into real letters and words when I type up my notes), another 15 mins uploading and formatting it, and about 20 mins proof-reading it (a necessary precaution given the retentive attitudes to spelling and grammar among my audit colleagues). But apparently it was only easy in school because a) there was no point to it, so every example was pretty well custom built to be easily represented and analysed in a Venn diagram format ; b) you just had to draw it with a compass, you never needed to force the native PC spreadsheet tool to draw the picture for you ; and c) I am getting thicker as I get older, but I don’t take that into account when I decide I want to do something. So my vision of publishing a series of complex 5-dimensional Venn’s to demonstrate some of my recent deep insights into personality types has been dimmed slightly into this, a little mini-deliverable to get me back into a constructive, success-oriented frame of mind, as suggested by a book I read years ago, before everyone in the corporate world jumped on the bandwagon. Anyway, here’s what I have so far, by way of getting something published again which is simple to produce. Its just got 3 dimensions. The diagrams for 4 and 5 dimensions, I have drawn, but not filled in yet. Assuming I maintain the same productivity rate, I expect it will take me about a day for each intersection, which if you remember your school maths lessons on permutations (or is it combinations?) is about 15 days for the 4-criteria one, and 31 days for the 5th one. I’ve gone way past caring about whether it is interesting to read any more, its just a personal vendetta I’m pursuing against my PC now, so even if it takes a year I will finish it. Perhaps I haven’t branched out that far after all. When is it OK to say to someone, "you are into dudes"? I don’t think its homophobic, but please correct me if it is. I am not naturally sensitive to that type of thing thanks to 7 years of all-boys Jesuit college, but I try not to offend people needlessly. I also try hard to offend people who do need it, but that is a subject for my next diagram in a later post (which will be about auditors I expect, if the notes I have are reliable).